Our decison to spend most of the winter aboard Amoenitas in Finike Marina on Turkey's south coast proved to be a good one. Not only was the climate very benign with temperatures never dropping below 10°C but with the exception of February which was very wet, most days were sunny with temperatures climbing to over 20°C. The biggest attraction though was definitely the active social life, with a chance to make many new friends and pursue a wide range of pastimes. For us, the days began at 07.00 with an hour's Yoga on Mon, Wed & Frid. The other two days we did Pilates as light relief. There was a vibrant cruising community with Brits, Dutch, French & Scandinavians to the fore, organising a vast array of diversions. 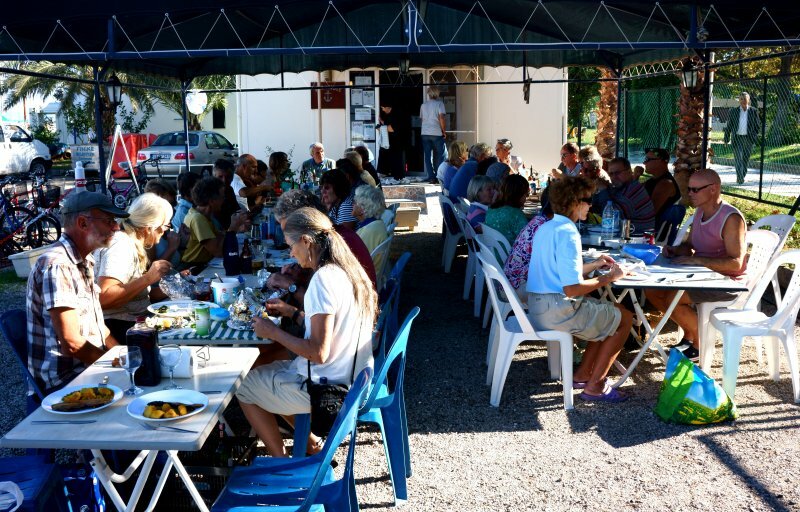 Mondays saw painting lessons, technical talks and film night, bridge on Tues, coffee mornings on Wed, Thursday was quiz night, hiking club on Fridays with trips to a symphony concert in Antalya every fortnight and pub night on Saturday. On Sunday there was a very well attended BBQ where we loved to cook trout, farmed in local mountain streams and bought fresh from a tanker in the market. The town itself was very Turkish, unlike most of the coast where tourism dominates to produce crowded places like Marmaris. In contrast, Finike with little or virtually no tourism other than the marina, there was little English spoken with a need to get to grips with the language which the marina staff helped by giving weekly Turkish lessons. Dave found his knowledge of German came into its own, as a surprising number of Turkish males seemed to have worked there at some time in their lives. The high point of the town week was the Saturday market, a huge sprawling affair which took over most of the central streets, probably occupying at least one square kilometre. It was mainly a farmer's and local artisan affair with clothes footwear and kitchen goods well represented too. We went along with our trolley every week to stock-up with a vast array of vegetables and fruit at prices we could hardly believe. Naturally one had to take what was in season but that was no problem which meant we got to feast on avocados, strawberries, amazing fruits, other fresh and dried foods, as well as nuts, the likes of which we had never experienced. A very varied, enjoyable and healthy diet. Finike's main claim to fame was that it was at the centre of a world renowned orange growing area with orchards spreading for kilometre after kilometre along the large, flat plain behind the town, hemmed in by high mountains which were snow capped virtually all the time we spent there. 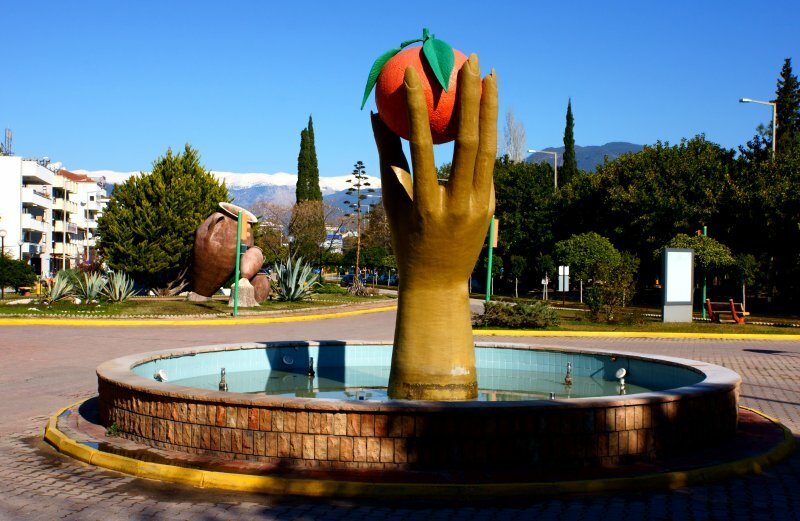 The streets of the town were also lined with orange trees, so at the height of the picking season in January and February, fathers would lift their small sons into the trees to throw down the ripe fruit. We of course made the most of the season by acquiring an electrically driven juicer to process lovely sweet oranges bought in the streets for around a pound for 8Kg. The social highlight of our weeks in Finike was definitely the Sunday BBQ where we would take turns to light the charcoal stove and set the tables. There was healthy competition to contribute something interesting to the pot-luck, so it was generally a culinary event of some significance. Only once did we get any rain to dampen our spirits but even that was shrugged off as it was relatively warm rain. Like most of the Turkish coastline, the region close around was scattered with a host of archaeological sites of some significance. The country appears to be host to some of the most interesting ruins and ancient rocks anywhere in the world. 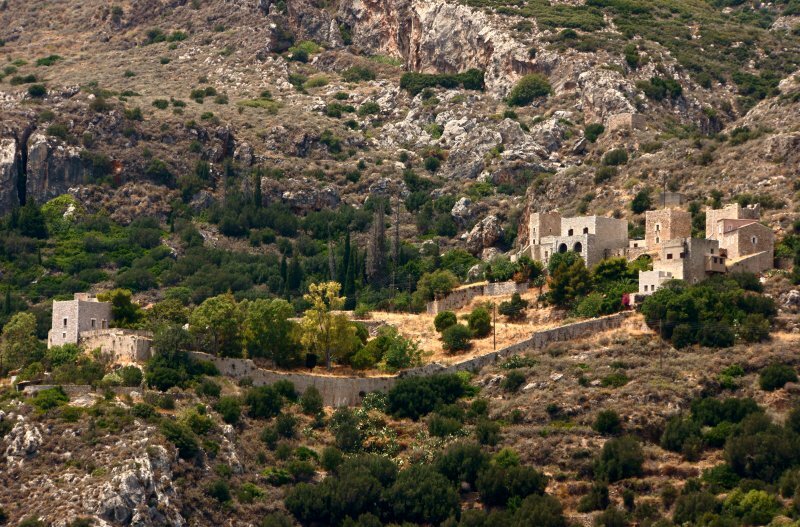 Sites like Arkanda, Demre, Limyra, Myra & Rhodiapolis were close by and often the focus of the hiking groups activities, aided by local bus services or a hired coach. At the end of April we reluctantly said our farewells to all our friends in Finike and headed west with old friends John and Jan from Romsey aboard for a two week break. Dave and John were at university together and they have been out to join us in the Caribbean, New Zealand, Australia and Thailand. After a few days around the always interesting Kekova Roads, we stopped off at Kastellorizo, a minute Greek island isolated just a couple of miles offshore, deep within Turkish waters. The harbour was charming, walks superb and history surprising. The town was evacuated and almost destroyed by Allied bombing during WW2 to prevent it being of use to the German and Italian forces. Its recent claim to fame is that almost all its young people have gone off to work in Australia where there is a thriving ex-pat community. There is also agreement in place that, should the permanent population drop to less than around 350, sovereignty will revert to Turkey. 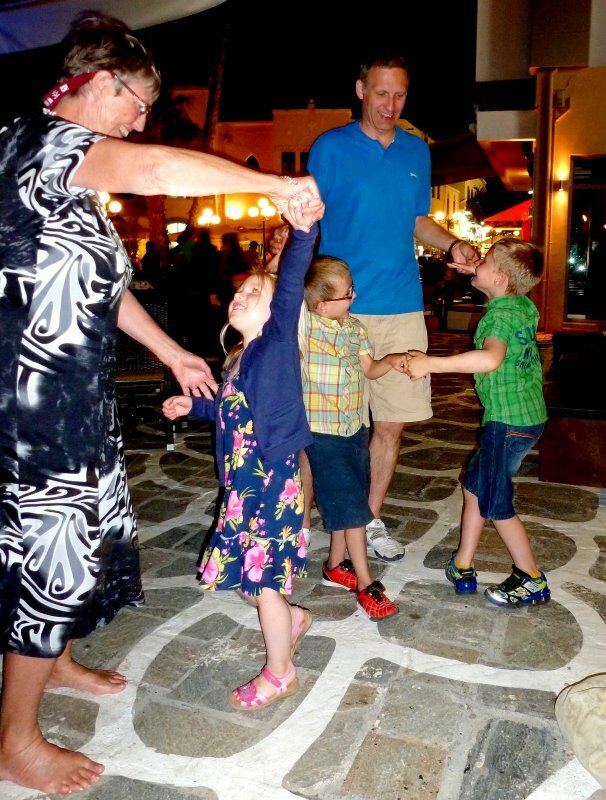 Our initial target was to be in Kos in the Greek Dodecanese islands for the UK summer half-term at the end of May. We had arranged for both our boys and families to be there together, a great joy for us as the grandchildren love being aboard Amoenitas and also it gives us pleasure to show them what our lives have been like for all the months and years we have been away from them. 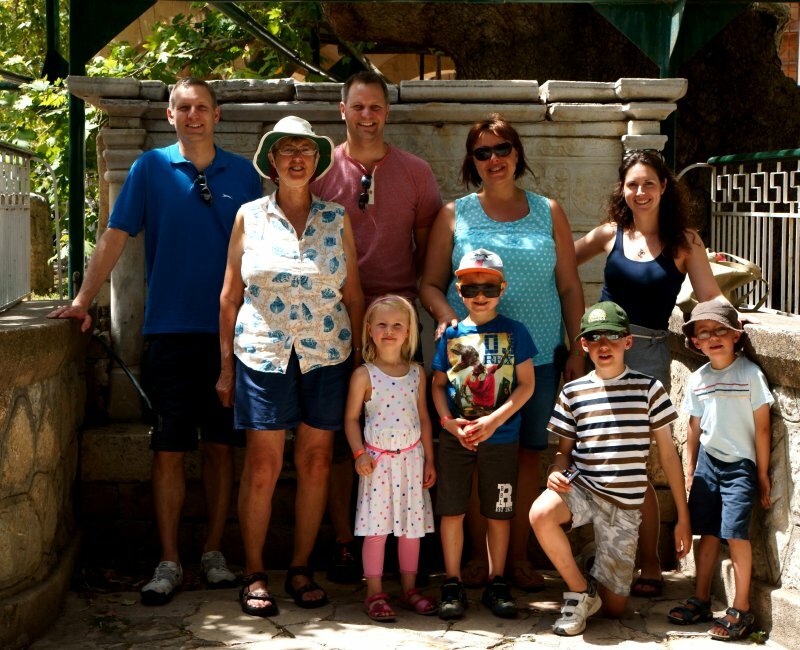 Here they are below in front of Hippocrates's tree in Kos town. From L > R, older son Bruce, younger brother Paul, Bruce's wife Tracey and Paul's wife Emma. In front Chloe & Alex, Paul's two (4&6) with Bruce's sons Sean & Ryan (9&6). Timed just a couple of weeks before Di's 70th birthday, we made the most of the opportunity to have a rollicking party aboard Amoenitas, followed by a memorable meal on tables outside a particularly good seafood restaurant. The grandchildren were all fascinated by the shops with tanks of small fish that one dangled ones feet into for cleaning which however did not seem to be attracting much trade. Grandad was volunteered to partake, so a joint deal encompassing all four sprogs was arranged. Much mirth was generated and Dave's feet did emerge looking a good deal cleaner but we reckoned they would have needed to have stayed submerged for a couple of weeks at least to make any impression on the accumulated dead skin. This scientific investigation complete, we all went on to dance outside a cafe. From Kos it is only a short hop north to the small, arid island of Pserimos which both of our two family groups visited on separate occasions. 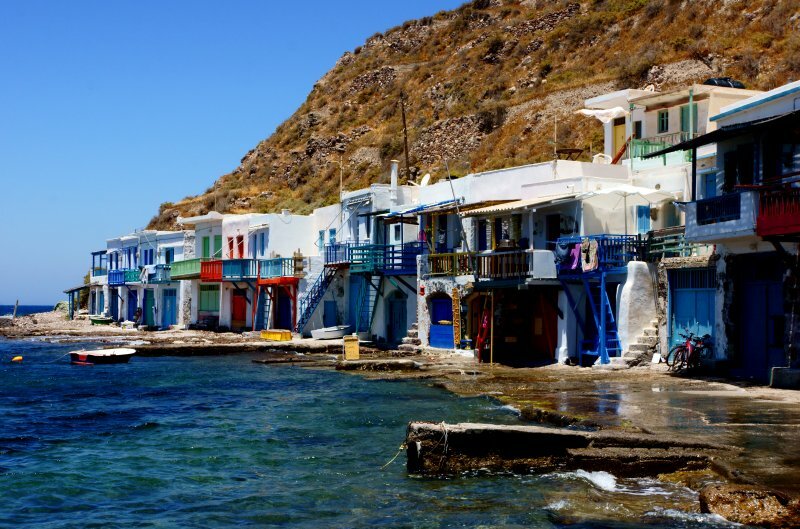 We anchored there in a small sheltered bay on the SE side and trekked over the steep hill on a goat path to Ormos, a sweet little town in a less sheltered, westerly facing bay. You can see that irrigation has allowed some of the valley to be cultivated but it is a very poor resident community, supplemented by families who return in the season to cater for tourists. We did our bit by patronising a pleasant beach bar, literally on the beach where children could frolic in the sea under the protective gaze of chilled out parents and grandees. 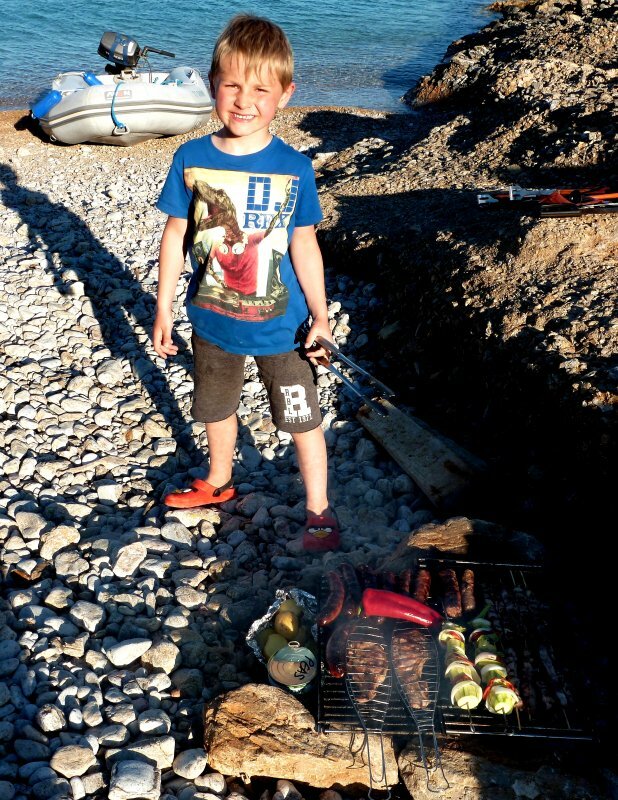 The anchorage was surrounded by a number of small beaches, ideal sites for our traditional beach BBQs. These have become a well honed specialty of our forty years of cruising the seven seas. So, where better to begin the training of the next generation of Jesingers into the subtle arts of driftwood selection, hearth building and coaxing a fire to embers that will sustain cooking heat for the required period. 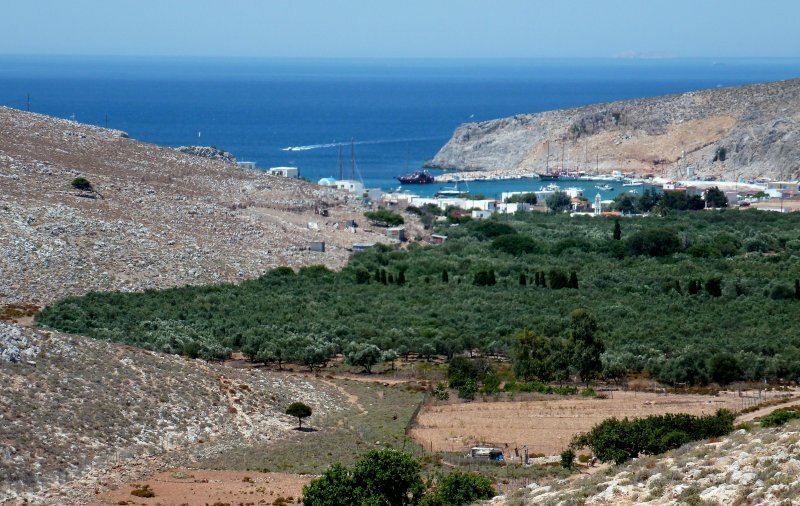 From Pserimos we headed north to Vathy on the SE corner of the island of Kalymnos with Paul and family aboard for their second week with us. We had navigated the entrance to the small port down a long, deeply indented channel between high cliffs the previous year. So, tied stern to the dock outside a taverna with swimming and good walking to hand was a great place to chill out. From there we went around the island to Pothia the main port where our visitors could get a ferry back to Kos for their return flight. This stunning view of the town was earned after a long, hot climb to the site of a large, recently built teaching monestary. 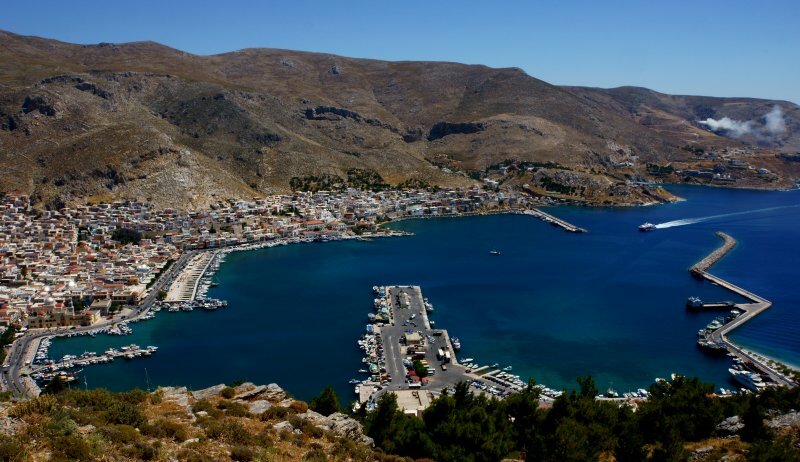 From Kalymnos we made good progress westwards via a number of small islands until it became apparent that we were about to come under the influence of strong Meltemi winds. These begin in early June being the result of a combination of a region of high pressure in the Black Sea and low pressure in the eastern Mediterranean. This turns the area of islands between the Turkish and Greek mainlands into a tunnel with 20-40kt northerly winds blowing day and night for 6-10 days, not good news for sailors! However, we found good shelter at a small marina in the town of Adamas on Milos, a fairly large and interesting island. We spent a useful week there, doing maintenance jobs, walking and exploring the place by bus and hired car. Klima the small cluster of houses below around the corner in the next bay from Adamas was particularly charming, if a little exposed. The sea is already a problem so one hesitates to think what effect a few more years of climate change and sea level rise will bring. Driving on Milos could be challenging, as aside from the few main arterial roads linking the villages, it was all very narrow with parked cars strewn randomly. We got to see most of the island including these impressive catacombs which were built between the 1st and 6th century AD. The main feature on the island was the Chora (cathedral) high at the top the hillside supporting a thriving artisan community with great restaurants. There was even a speciality sand shop with many examples from around the world, some worked decoratively into art works. We even managed to add to the owner's collection by donating samples of the coarsest sand (from the Galapagos) and finest (Koh Payan in Thailand) that we had come across in our travels. After being hunkered down for a week we were keen to get underway to the Peloponnese, the three fingers that reach out into the Mediterranean from the southern Greek mainland. This was an area steeped in tradition with a distinctive culture which included the warrior tribe that was the power behind the city of Sparta. The region was notoriously known for its warlike, troubled history. Some places were the antithesis like the placid small fishing village below which we reached after two bus journeys through arid, mountainous country. We based ourselves at a shoreside taverna where we could chill out and snorkel in the superbly clear waters. The whole area of Mani province in the Pelopennese was strewn with fortified homesteads and tall watchtowers. It was a region beset by warring clans, feuding families and incessant inter community violence which perpetuated into the late 1800's. It was such a no-go area for law and justice that it was only pacified after a long and extensive campaign by the Greek national army. 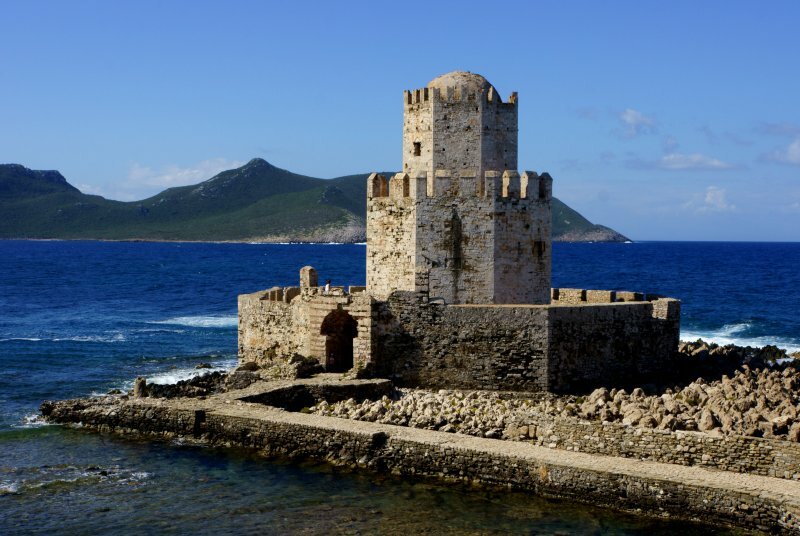 Having worked our way across all three of the Pelopennese fingers, we reached our point of departure from Greece on our way to Italy at the historic port of Methoni. In addition to this picturesque outer Turkish fort there was a much larger Roman walled, fortified town covering an area of around two square kilometres. A fitting point to round for what turned out to be a pretty good passage to Sicily which took around 60 hours. Med passage making can demand a lot of motoring to maintain progress, especially on a trip like this with predominant north westerly winds, just off the starboard bow. However, on this occasion we had a good deal of luck and with Amoenitas's prodigious performance to windward we completed a relatively fast passage with under 20hrs under engine. 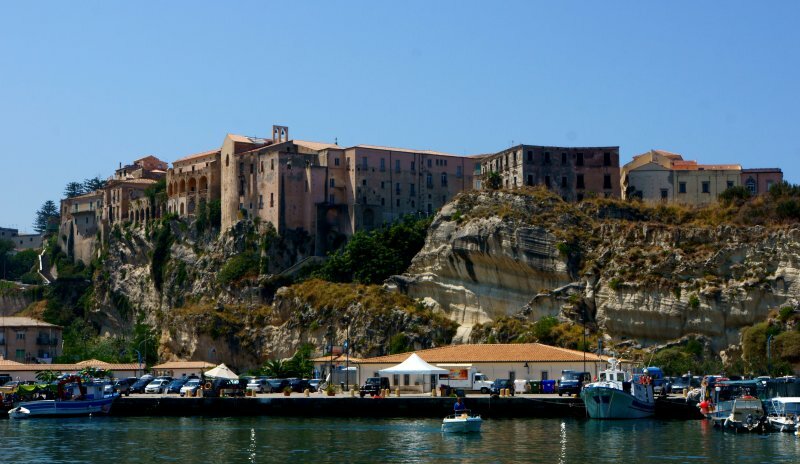 We were greeted by another impressive fort in the entrance to Syracuse on the SE coast of Sicily, birthplace of the preeminent mathematician and engineer Archimedes. The harbour there proved to be large, open and very welcoming after Greece with its strong winds and often cramped anchorages. 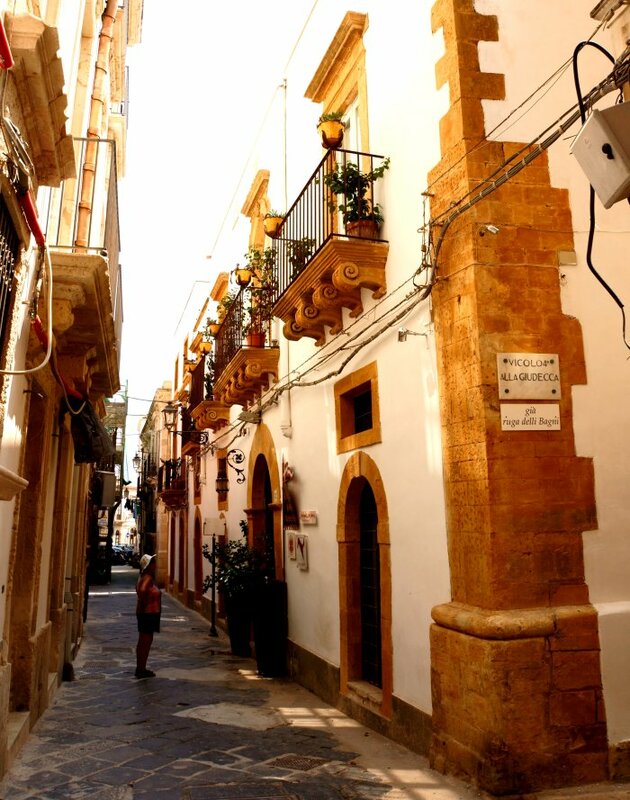 We settled close to the old historic town which occupies the island known as Ortygia, separated by two bridges from the modern town adjoining to the north. 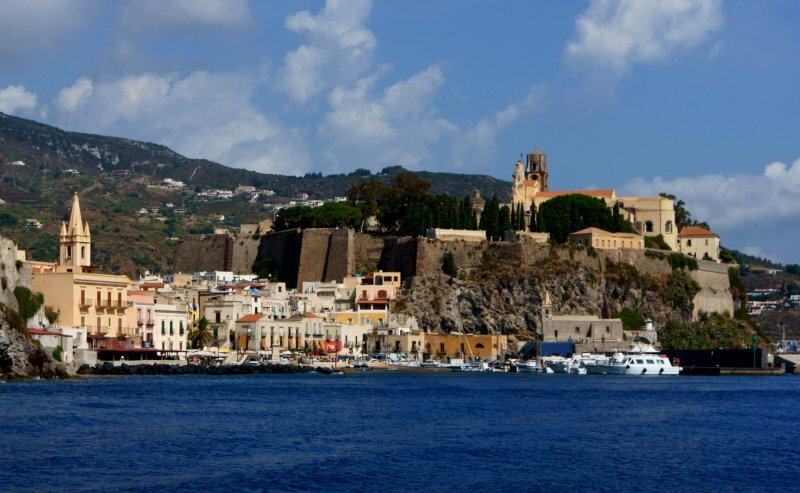 Anchor down, we immediately went ashore to feast on the renowned Sicilian cuisine plus ice cream to die for. The old town is a tourist's delight with a plethora of historic buildings, set on a long peninsula north of the fort, surrounded by beaches and cliff lined beaches. Like so many continental warm country cities, it comes alive at dusk with promenading visitors, vendors and street performers. The many street cafes encourage one to sit with a drink and imbibe the atmosphere. Dominating the main square is this imposing cathedral with a relatively modern frontage built onto a medieval main building. 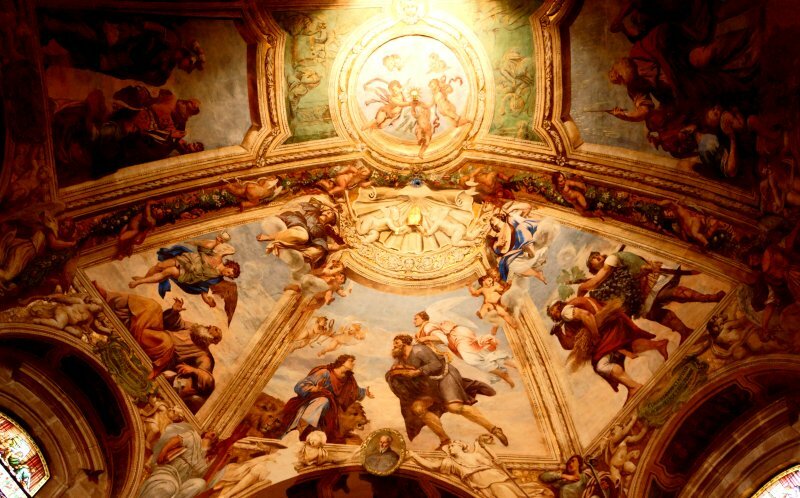 Within the cathedral are many small side chapels housing religious relics in lavishly embellished surroundings with ceilings such as the one below. Throughout Italy the eye is constantly assailed by architectural and artistic wonders to the point where one is in danger of becoming desensitized. All of the old town is based on very narrow streets which are mostly impassable to cars, with motor and push bikes providing the bulk of private transport. It was such a sheltered and convenient place after a period of extended passage making , we were quite content to chill-out there for a couple of weeks. Throughout the daylight hours the town seemed unusually subdued for the height of the tourist season. That all changed as night fell and holiday makers swept in to throng the place. Still, couldn't complain as we were tourists too with the advantage that many musical and other events were being staged. 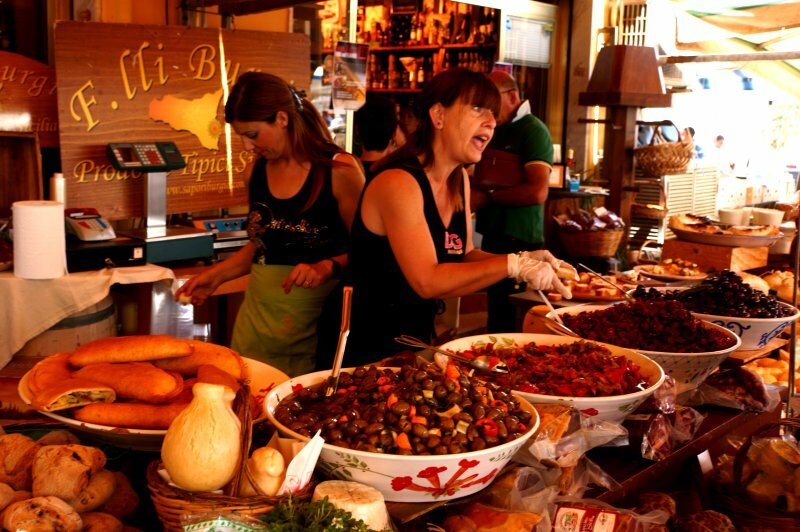 Without doubt, cuisine and good food is close to the hearts of all Sicilians, as any visit to a local market will confirm. Stores packed with hanging cured hams, cheeses in profusion and fresh fish and vegetable stalls to die for. That's without mentioning the multitude of ice cream stalls offering upwards of thirty flavours. Certainly not a place to be on a diet. Around 5Km north of the old town lies an historic area with a magnificent archeological museum close by which specialises in local sites and antiquities. It is also so detailed and comprehensive that one felt one needed a PhD in Sicilian antiquity to make the most of the exhibits. Below is the impressive Roman amphitheatre a couple of kiliometres from the museum which despite its age leaves little to be filled in by the imagination. Dave is quite taken with the technique used to capture these next two images which are challenging because their angular extent is way beyond what can be encompassed by a wide angle lens. Using in-camera stitching, one captures the scene as a series of horizontal strips which are then stitched vertically in a computer to give the overall image. This has the added advantage that it does not introduce the distortion introduced by wide angle lenses between 10 and 30mm focal length. Less than a Km away was a further immense site where the Greeks had built their amphitheatre which offered yet another two-way stitch opportunity. Between the two theatres was a huge quarry from where the stone for their construction had been hewed. 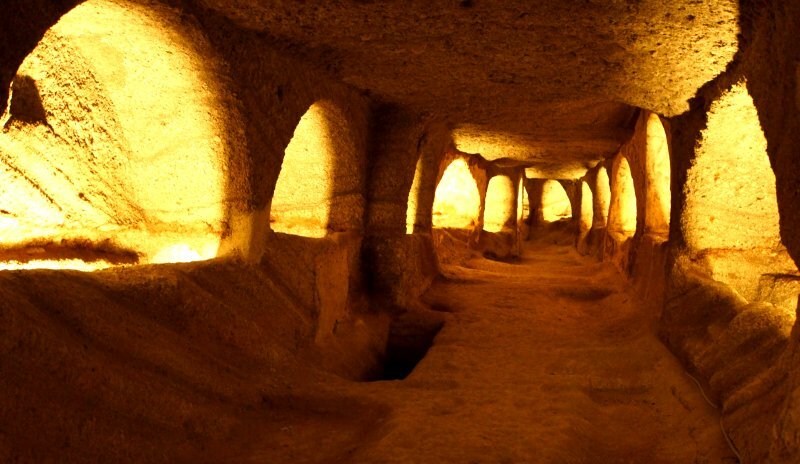 This covered an area approximately equivalent to them both which suggests the ancients had solved the transportation problem by building where the raw materials were. Unusually though it had been an underground quarry where almost all the roof had caved-in but for a small area with a high cavern which aptly demonstrated the immense scale of the undertaking. 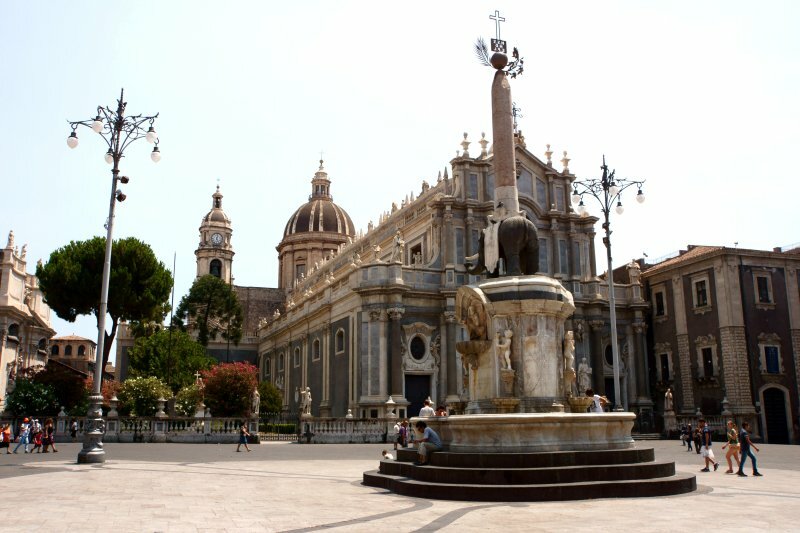 We moved on northward eventually to the major local port and commercial centre of Catania. Great for culture but not so convenient a place to visit by boat. The three local marinas were small, packed and dirty so we anchored south of the port, just under the shelter of the outer mole. Of particular interest there were two remarkable museum collections amongst many which occupied the site of an old sulphur processing industry which had been the mainstay of the towns economy for many decades. One was a collection of many hundreds of domestic radio sets dating back to the days of Marconi. Dave managed to escape by taking pictures of only 286 of them! Great nostalgia was evoked as in his early youth he was donated scores of old radios by family, neighbours and anyone close enough to stagger to the door with them. The other outstanding museum was dedicated to cinema photography which again had been a mainstay of the Sicilian scene in the early 20th century. Both were exceptional and worth a detour for anyone in the area. Towering over Catania to the north was Mt Etna, the tallest active volcano on the European continent, currently 3,329m (10,922ft) high. How could we possibly resist? After a two hour long, grinding, zigzaging climb by coach to a visitor centre, one ascends by ski-lift to a point where four wheeled drive trucks take over. 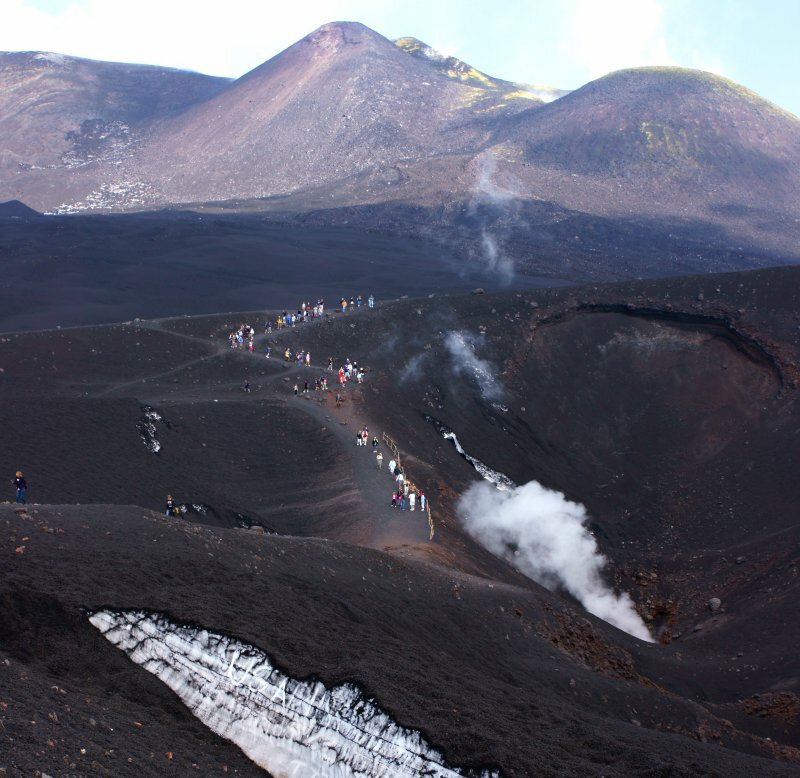 At an altitude of 3,000m (9840ft) we dismounted just short of the summit to explore several old eruption sites on foot. There are currently five active craters and over 300 side fissures with serious events every few years. The latest was in November of this year and yes, the air is thin at that altitude so dashing around was not an option. What we had failed to understand until that day was the enormity of the forces that were regularly unleashed on the southern edge of Europe. The last major eruption was in July and August 2001. 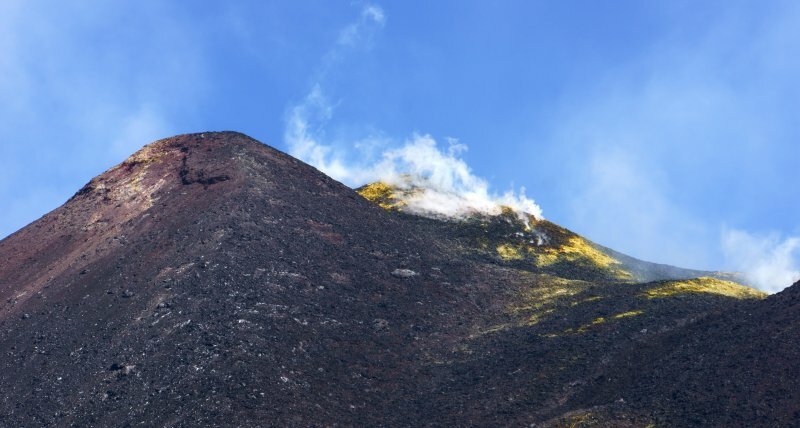 This involved activity from seven distinct eruptive fissures mostly on the south slope of the volcano destroying the ski lift and much of the tourist centre. Our route by road was through the extensive lava field from that event which seemed to be around 5Km wide, extending around 10Km down the mountain side. Houses by the rebuilt road were buried beneath fresh lava to roof level. Moving north we seemed to be followed by the towering, 3329m but shallow sloping volcano (basal circumference of 140km), even 25Km further north at Taormina it was there as a continually smoking reminder. This latter town is a major tourist attraction, set high on a ridge which juts out into the sea forming a sheltered bay to its south. Amoenitas is one of the inshore boats in the picture below with Etna in the background. We had a pleasant anchorage, close to a beach in the bay here, just opposite the railway station and bus stop with a small holiday town with all the supplies we needed within canoeing distance. So, we chilled out here for a further two weeks taking buses up to the town, attending cultural events and using the rail and bus services to reach out further into the hinterland. The sea was unusually clear too which was usefull as our stays in Syracuse and Catania had resulted in serious fouling of the hull which we removed in our frequent dips to cool off. 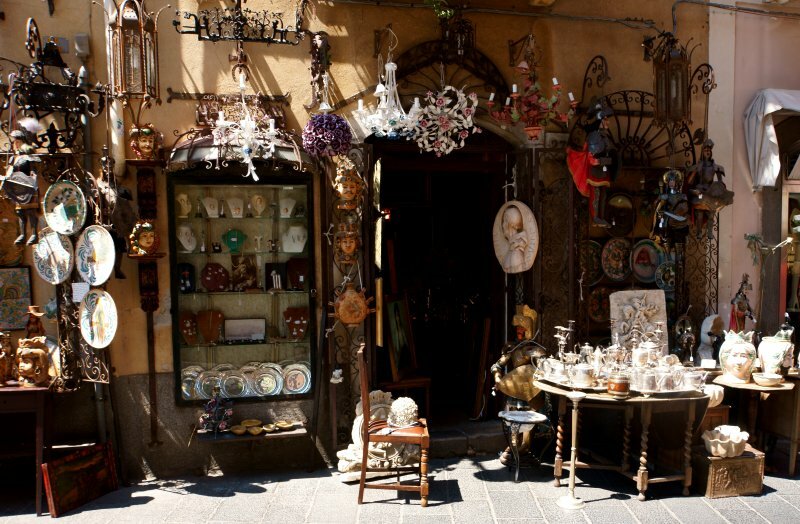 We already mentioned that the town of Taormina was popular with tourists and probably on every one of their itineraries. It is chocka with shopping opportunities for just about everything that we don't and never will need, at prices that are guaranteed to bring tears to the eyes of old gits such as ourselves. Nevertheless, it was great to wander amongst the masses from all over Europe and beyond, sticky-beaking and observing the human specie on vacation. 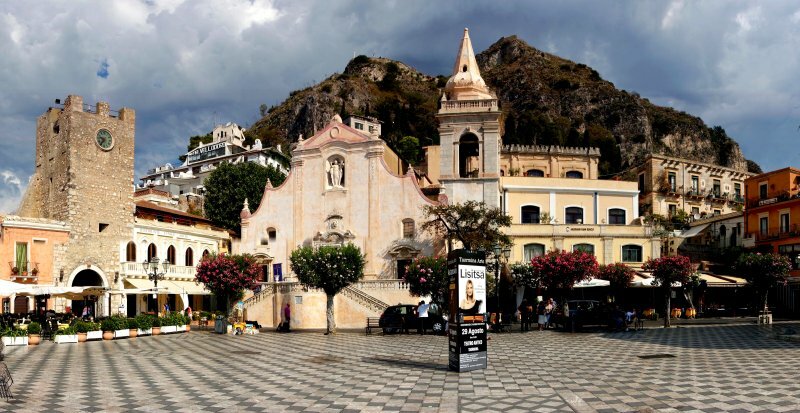 The main Taormina attraction is the Theatre Greko, acclaimed as the most impressive Greek structure of its type anywhere. Naturally, it was aligned with a view of 'that hill' on its boresight. From its walls there are magnificent 360° views. At night Theatre Greko was often transformed into a most evocative venue for life performance and being Italy, opera was the favourite. 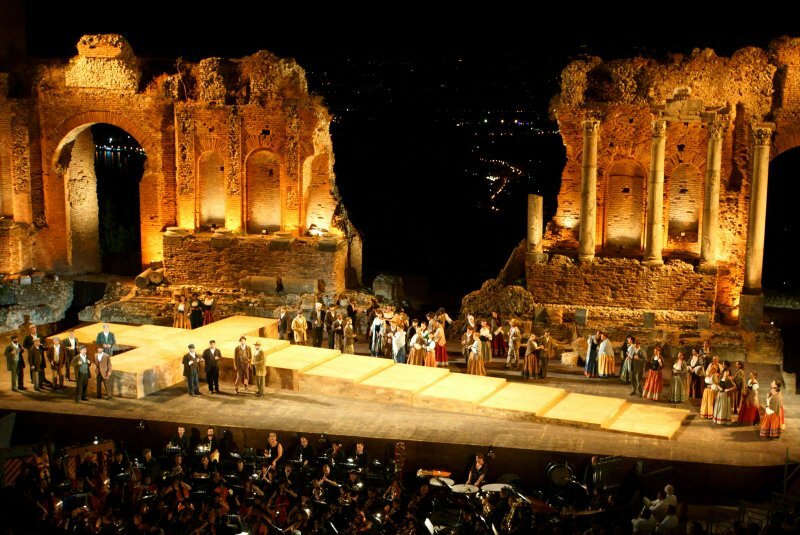 We were there for a memorable performance of Mascagni's tragic operetta Cavaliera Rusticana . 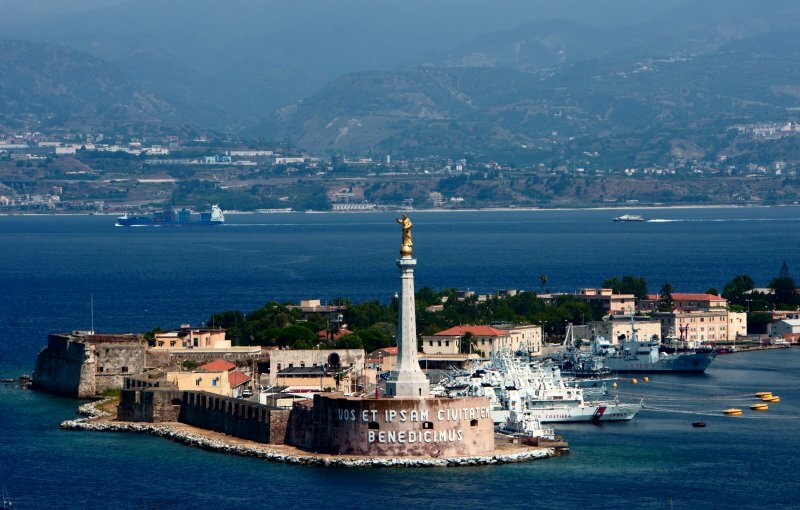 One of our day trips out from the anchorage was by train to Messina, right up by the straight of the same name which separates Sicily from the mainland and is less than 1.5nm wide at its narrowest point just north of the town. Sadly when we got onto the train we hadn't realised the tickets we had bought were for specified seats, so it took several trips up and down corridors packed with travellers and their luggage to locate or perches, by which time we were nearly at our destination. 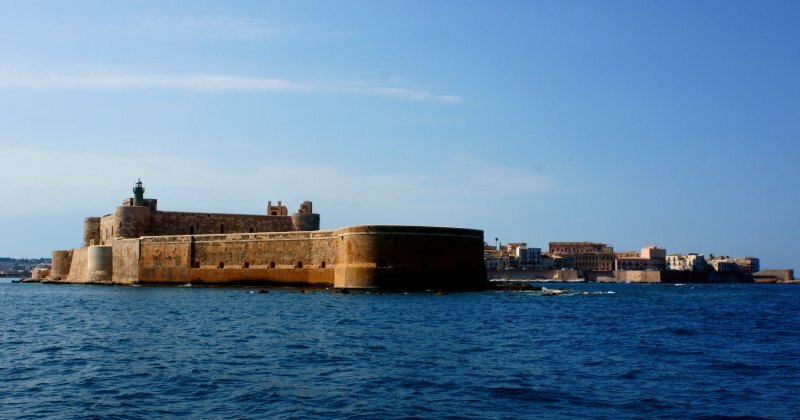 Below is the fort at the entrance to the town's harbour. There was an impressive cathedral in Messina with a large square tower which sported numbers of animated figures that did their thing on the dot of noon. Luckily we were there by chance just a few minutes earlier and seeing the gathering crowd, hung on for the show which began with a lion that stretched and beat a drum to the accompaniment of loud sound effects. There followed a parade of medieval dignitaries before a figure of Mary and scenes depicting the building of the cathedral. Predictably, the innards of these tableaus had originated in Switzerland. 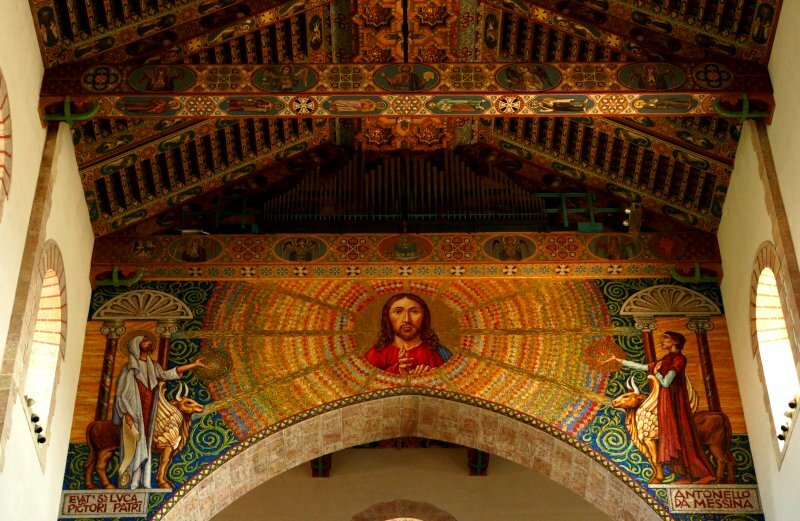 Below is a picture of the intricately decorated ceiling of the building. Our passage through the Strait of Messina was timed for slack water but even so, we were spat out of the northern end through a number of whirlpools with some gusto. 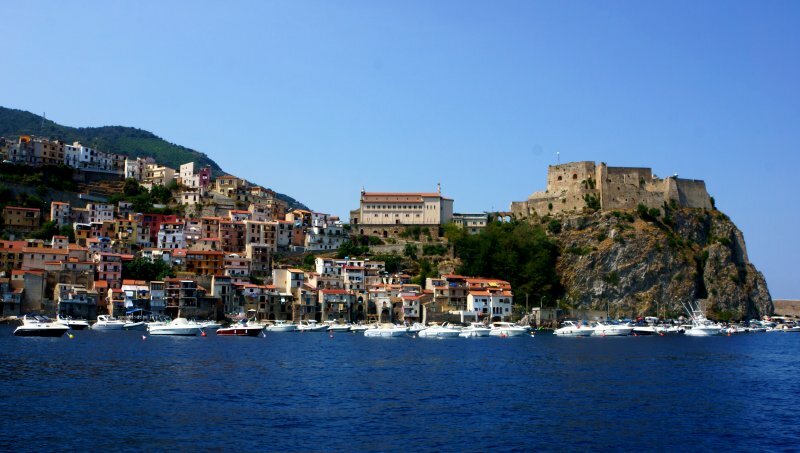 Our destination was Scilla, a charming town set again on a protruding outcrop into the strait. We found safe anchorage on a rare patch of sand within what was otherwise a very rocky bottom. Our exploration of the town that afternoon began with Castle Bufo on the RHS of the picture where a traditional Sicilian marriage ceremony was about to begin. We thought that was most fitting as that day was the 48th anniversary of our marriage. Both our stays in Scilla on our ways north to Calabria and returning from the Aoelean Islands were memorable for the friendly locals and insights into local traditions like swordfishing. This was carried out in the entrance to the strait where the fish bask in the swift currents. Traditionally, around six to eight fisherman rowed the craft with one watching out for swordfish from a short mast with a basic form of crow's nest lookout and a further one in the bow with a tethered spear. This has evolved over time to become an around 30m long powered vessel with a spidery 40m tower for the lookout and an equally flimsy bowsprit around 40m long to carry the spearsman way ahead of the noise of the boat's engines that would otherwise alert the fish. How they inched the whole contraption into the small harbour we'll never know. 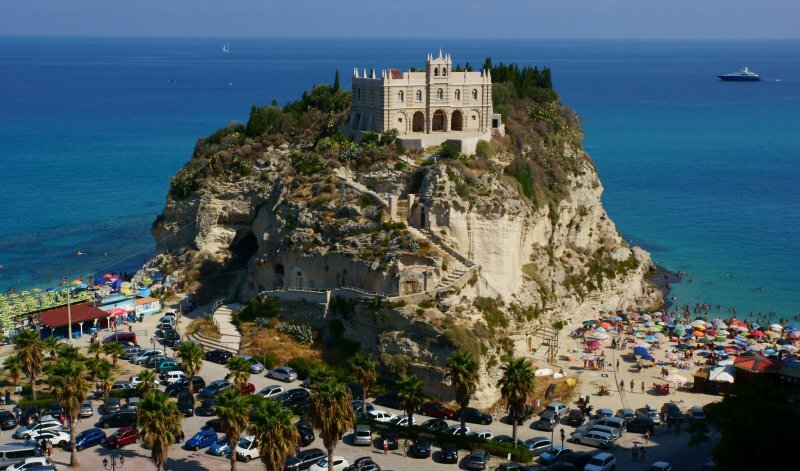 Much of the Calabrian coast was low and uninviting but at places like Tropea, rocky outcrops had again tempted the medieval developers. This was a town of many hills and great character, almost exclusively the haunt of domestic tourism. Yet again the time to dress-up and flaunt was after dusk. Below is a palace/castle set on a prominent rock opposite the centre of the town. Note the punters packed into the available beach space. 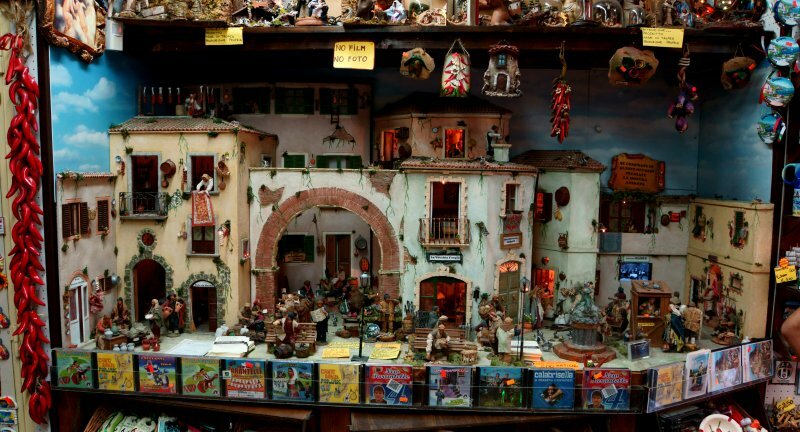 Our favourite shop in town featured this clever animated scene from a Calabrian village square. It contains around forty independent moving figures carrying out the most precise of movements like the woman shaking the carpet out of the window. All built by the family of shop owners. Forget the 'No Foto' sign, we got a dispensation after spending a fortune on pottery fish which are destined to populate two colourful tropical shoals moving toward each other on the front wall of the house. Problem two of how to affix them to the wall is hard on the heels of problem one, how to get them all back to the UK. Eventually tiring of going from one crowded mainland resort to another we struck out for Stromboli, the nearest of the Aeolian Islands. This name means 'Windy' which after an incident about two weeks later we attest is quite appropriate. Stromboli, a still active volcano, has a very small resident community whose homes are heavily outnumbered by the luxury, holiday retreats of the seriously rich. Good place to hang-off for a couple of days maximum and then only if the weather is super settled. 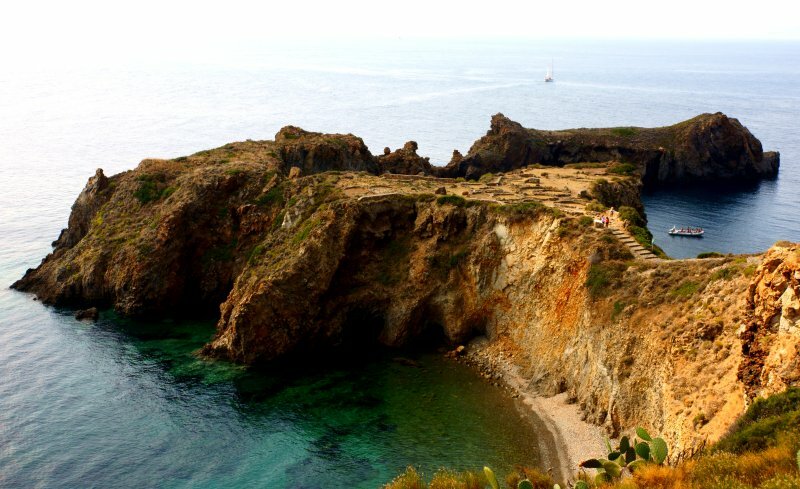 The next island just 20nm to the SW is Panarea, somewhat bigger than Stromboli but based on the same business model.....secluded, bijou, vacation retreats for the well heeled. On the SW point of the island was an interesting archeological site of a fortified village occupied between the 15th and 13th centuries BC. The inhabitants were thought to have come from Thrapsos, a Bronze Age community in the province of Syracuse on Sicily. In its heyday the area of land was much greater and was totally filled by mainly oval shaped buildings but erosion has sadly taken its toll. With its original protective tower astride the narrow entrance path and steep sided cliffs, it was an almost impenetrable fortress community. Next island on the route was Lipani, much bigger and with a much more representative community. The problem here was finding somewhere shallow enough to anchor on the sheltered eastern side. Like most of the region in the height of the summer season, everywhere was full. So we tried our luck off a quiet bay to the west of the town, searching for a sandy patch within the weed in around 14m of water. Of course Dave had to dive down to check it and it was not good. However, around 10m further out was what appeared to be a large concrete block with a substantial sunken, looped rope leading from it. Free diving to around 16m Dave just managed to attach a light polypropylene line to the loop and shot upwards like a Polaris missile to gasp for air for around 10mins. Definitely a demanding way to discover your limits. This done we were all set to explore the island without fear of Amoenitas dragging. Added to which we had several days of amusement watching other boats attempting to anchor around us and departing wondering what these Brits were using for anchoring tackle. We left Lipari when strong winds from the east were forecast which would have rendered our trusty mooring prone to bigger seas with the risk of chafing. How wrong can they be? We went on to what should have been a protected NW facing bay on the island of Vulcano a short way away. Having been anchored there for less than an hour, in a shallow bay along with around 50 other boats with the same plan, all hell broke loose. Storm force winds of 45Kts came suddenly from the NW, bringing 3m waves into the bay. Everyone tried to up-anchor to escape, tenders were filling with water or just blowing away and boats were starting to collide whilst manoeuvering. We went to haul in the anchor only to discover the windlass motor was totally dead! Then began a testing hour or so of extreme striving to survive intact, under almost constant risk and conjuring up what one might like to describe as superhuman effort. Probably the most dangerous spot Amoenitas had been in since we bought her over 16 years ago. With Di at the helm controlling all 110HP of our faithful Yanmar engine and Dave on the bow directing whilst attempting to raise a 34KG (74lb) on 50m of 10mm chain by hand. On the bow was not a good place to be with 3m waves sweeping in and crashing over most of the boat. Very gradually we brought the chain aboard whilst taking avoiding action against other boats out of control, some coming within 2m of us. Inevitably of course, as the chain came in, we dragged almost continuously to such an extent that when aboard at last, the galvanised anchor looked rather different, as being dragged through the sand had polished it to shine like a new stainless steel one. Safe in deep waters, two very soaked, cold mariners hugged to congratulate each other for a dire situation narrowly avoided. Well done again Team Jesinger. Later that night in a quieter SE anchorage, Di decided she'd seen enough of the windy islands. Life from then on was quite different without a powered windlass, recovering the anchor was a long, hard process which had to be done in shallow waters and preferably benign conditions. Back in Syracuse we were able to source a replacement Lofrans windlass which was simplified by their being made in Italy. It is now stored on th boat awaiting the fitting-out season! 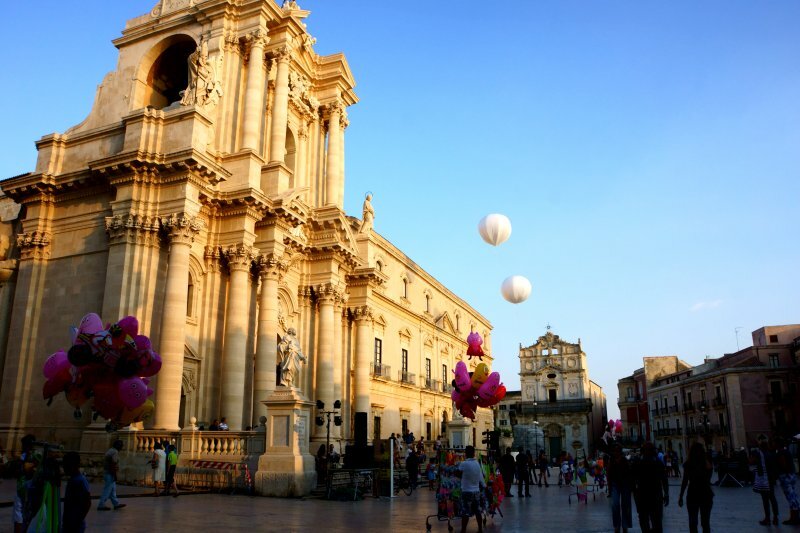 We made it into Ragusa, our base for the winter, at 06.30, four days before our flight home, having sailed through a very rough night to avoid stronger winds in the day. Don't imagine Mediterranean sailing is all roses! We have enjoyed two seasons of Mediterranean cruising much more than we had expected but after the remote (less crowded) and exotic places we have explored over the previous twelve years, it is somewhat passé. Sailing back to the UK's even more crowded, murky, cold waters with more turbulent weather systems holds even less attraction. We took back our home, Greenacres in the New Forest in late September, after over 14 years of it being rented-out unfurnished. It is wonderful to be back nest building in our rural home of over 43 years, amongst so many old friends. Our current feeling is that we will go down to Tunisia next season, to fit-out, returning to the Mediterranean coast of France via Sardinia and Corsica. We may well head for Port Napoléon at the mouth of the Rhone where we can have Amoenitas hauled-out and put her on the market. What a horrible thought, as any parting will be seriously traumatic for all three of us.